This symbol is unique to New Zealand specially. 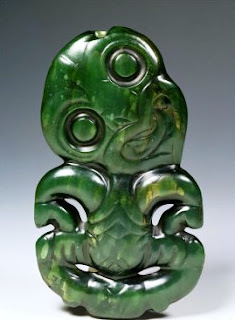 It is usually made from Pounamu and is worn green stone around the neck as a good luck charm. The Tiki is very popular and means the creation of new life. It helps to clear their mind and learn. That's a very nice picture of a tiki you found, Nikhil. Where did you find the information from? I found this from a cultural website. Isn't that good? Well done.I like your picture. Did you like your work? I really like my work. I made a big one for the class wall.